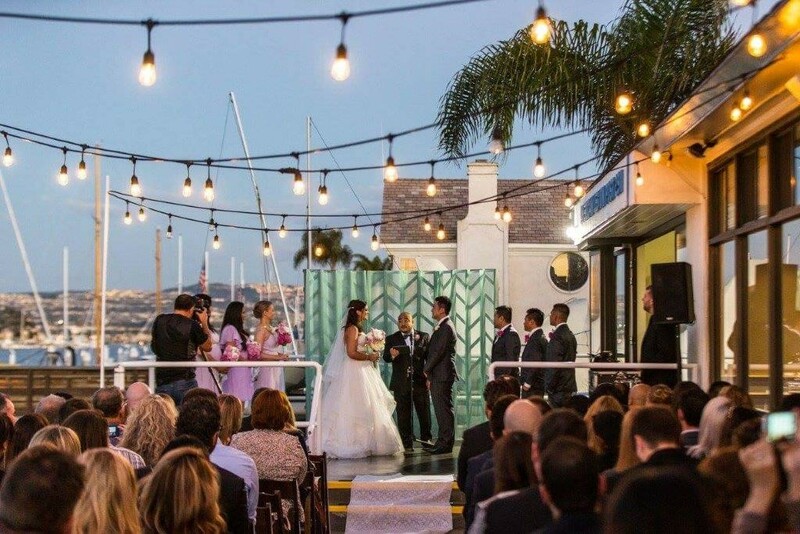 Book your wedding at The American Legion Post 291 in the beautiful Newport Beach Marina. 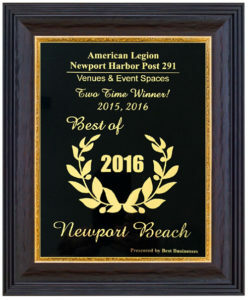 The American Legion Post 291 in Newport Beach, California is a wonderfully unique waterfront venue for any and all special occasions. We have various rooms of different sizes to create intimate or grand settings. We can host parties from 20 to 300 guests. Our courteous and professional event team is here to assist you with all the details. Our Grand Hall is nearly 4,000 square feet has a raised full stage, hardwood dance floor, lighting, PA system, built in LCD projector with a large pull down screen and a satellite bar. Accommodates up to 250 guests. Our View Room is attached to the Grand Hall and overlooks our gorgeous Marina with floor to ceiling windows. Accommodates up to 40 guests. Our outdoor East Patio runs right along-side the beach and bay. Accommodates up to 50 guests. Our elegant Fireside Room with its own attached outdoor patio and removable glass wall, allows for the perfect indoor/outdoor celebration. Accommodates up to 50 guests. 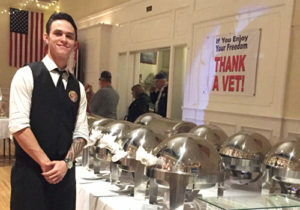 Each rental includes tables, chairs, white linens and napkins, silverware, glassware and beverage station (iced tea, water, lemonade and coffee) for five hours. Our Grand Hall includes one bar setup with bartender. You can choose to rent any one space at a set price, or choose our Deluxe Wedding Reception Package, which includes use of our entire facility: Grand Hall, View Room, East Patio, and Fireside Room, thus insuring the utmost privacy, attention, and space for your special day! We also allow setup time before the event at no extra cost. Event set-up and clean-up is included. Our banquet options include crudité, appetizer, salad, your choice of entrée with vegetables, potatoes, house-made rolls and butter, dessert and champagne toast. All of our offerings are made in house under the supervision of our award-winning chef Ulises Domínguez. For price information please contact us directly and we will be happy to customize a menu for your special occasion. Tax and service charge is additional. This is just some basic information, our team here at the American Legion Post 291 pride ourselves on personalizing your occasion. Unlike other venues that have set packages and menus, we love to get a feel for each client before we finalize the menu and details. making your event a memorable occasion.